Researchers in the School of Biosciences have developed a simple and cost-effective test to diagnose sleeping sickness, a disease widespread in sub-Saharan Africa. The test removes the need for extensive infrastructure such as electricity, refrigeration and large teams of skilled people that can hinder access to diagnosis and treatment. The blood spot tests, which can be manufactured for as little as £1, are simple to use and give results in 15 minutes. This enables those carrying the disease but who are not yet symptomatic to be diagnosed and treated promptly, preventing both disease progression and the individual from infecting others. 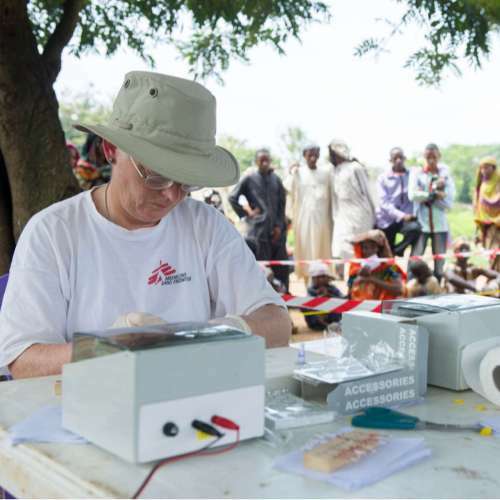 Lead researcher Dr Barrie Rooney identified the need for a quicker, simpler diagnostic method after spending 10 years working in the field for Médecins Sans Frontières (MSF). She says: ‘Particularly in developing countries where people have to travel miles each day for food, water and healthcare or are displaced by war, there is a need to diagnose and treat infectious diseases where and as they occur, rather than letting them develop into epidemics. Sleeping sickness – human African trypanosomiasis – is caused by the parasite Trypanosoma brucei gambiense, which is carried by the tsetse fly. Other diagnostic methods not only require large amounts of equipment and expertise, but also involve painful and time-consuming procedures such as lumbar punctures. Diagnosis can take weeks, during which the infection can spread to hundreds of people. Dr Rooney first approached Professor Mark Smales at the University in 2012 with the idea for the test. With help from a BBSRC FLIP grant, she made the move from the field to the laboratory and soon identified three antigens, or markers, that could recognise the sleeping sickness parasite in a blood sample from someone carrying the disease. Crucially, the researchers produced recombinant antigens – genetically engineered protein molecules – from an organism closely related to the sleeping sickness parasite, rather than using the sleeping sickness parasite itself. This reduces the cost and also prevents test manufacturers from being infected with sleeping sickness. Sleeping sickness is classified as a Neglected Tropical Disease (NTD) by the World Health Organisation (WHO). This means that it has little investment by pharmaceutical or diagnostic companies. 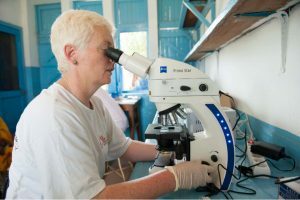 However efforts by researchers such as Dr Rooney and organisations like MSF have substantially reduced numbers of cases with 2,804 new cases reported in 2015. This is the lowest level since the start of systematic global data-collection 76 years ago. However it is still a threat to millions of people in 36 countries and without prompt diagnosis and treatment, it is nearly always fatal. The test is currently undergoing clinical trials in the field. Laboratory results have shown that it has a 98 per cent sensitivity (able to identify 98 per cent of patients with the disease) and 99 per cent specificity (able to correctly identify patients without the disease).